Why do accountability systems matter for equity? 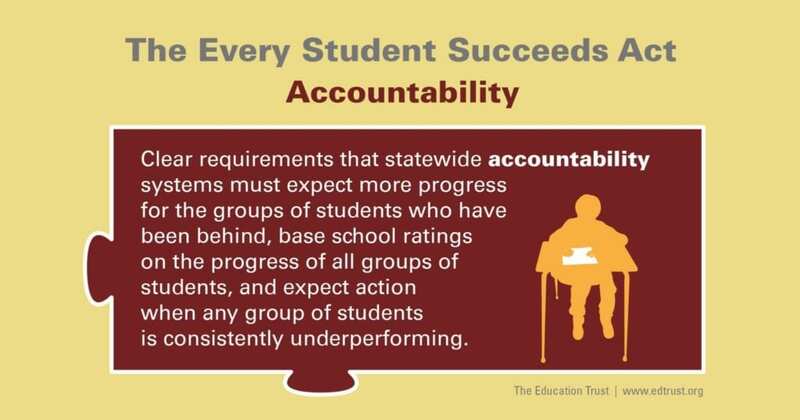 Accountability systems are the set of policies and practices that a state uses to measure how schools are performing for students, reward those that are serving all of their students well, and prompt improvement in those that are not. Strong accountability systems create a clear expectation that schools must make progress with all groups of students, not just some; help focus attention and resources on the full range of student groups; and ensure that accountability isn’t limited to the lowest performing schools: When any group is struggling, schools and school systems can’t simply sit by and watch — they have to act. What does the Every Student Succeeds Act require? States must set goals for increasing the percentage of students who reach state standards in reading and math and for raising graduation rates. These goals have to be set for all students, and for low-income students, students from major racial/ethnic groups, students with disabilities and English learners, respectively. They must require improvement for all groups and faster improvement for the groups that have been behind, meaning that, if the goals are met, gaps between groups will narrow. Each state must then rate schools based on how they perform on these goals and other indicators, for all students and for each student group. If any group of students in a school is consistently underperforming, the school’s rating has to reflect that fact. Another academic indicator: For high schools, a measure of how graduation rates for all students and each student group compare with state-set goals. For elementary and middle schools, this measure may include individual student growth or another statewide, valid, and reliable indicator of student learning. Additional indicator of school quality: Another valid, reliable, and statewide indicator of school quality, which may include measures of postsecondary readiness, student engagement, or school climate. The indicator must measure these results for all students and each student group. States will determine exactly how much each indicator will count in school accountability ratings, but the first three indicators (academic achievement, another academic indicator, and English proficiency) must each carry substantial weight, and together, carry much more weight than the additional measure of school quality. In addition to including these indicators, states must also explain what will happen to a school’s rating if fewer than 95 percent of all students, or of any group of students, participate in the state assessment. Comprehensive Support and Improvement Schools: This category includes the lowest performing 5 percent of Title I schools and all high schools with graduation rates below 67 percent. For these schools, districts2 must develop improvement plans, which may include a review of district- and school-level budgeting. The state has to review and approve these improvement plans and set “exit criteria” for these schools (i.e., levels of performance that they have to reach to no longer be identified in this category). If a school fails to meet these criteria within no more than four years (the state can set a shorter time frame), the state has to intervene. Targeted Support and Improvement Schools: These are schools where one or more groups of students are consistently underperforming, as noted in the ratings. These schools must develop improvement plans, which have to be approved by their district. If schools fail to improve within a district-determined number of years, the district has to require additional action. Additional Targeted Support and Improvement Schools: These are schools that have one or more groups of students whose performance would place them in the bottom 5 percent of Title I schools. Like Targeted Support and Improvement schools, these schools are required to put together improvement plans that must be approved by their district, but these improvement plans also have to address resource inequities. In addition, states must set exit criteria for these schools, and if schools don’t meet these criteria in a state-determined number of years, they become Comprehensive Support and Improvement Schools. What key questions should equity-minded advocates be asking? What are aggressive but achievable goals, especially on new assessments aligned with college- and career-ready standards? Beyond tests and graduation rates, what indicators will add to the picture of school performance for all students as opposed to masking important outcomes? What’s a rigorous definition of “consistently underperforming” for student groups, especially on indicators for which there aren’t clear goals? What are the appropriate supports and interventions for the lowest performers? For schools with underperforming groups? What time frames for supports and interventions allow time for improvement activity to take hold, but don’t allow students to languish? 1. For the purposes of the accountability system, states have to calculate proficiency rates by dividing the number of students who score at the proficient or advanced levels by the larger of two numbers: a) The number of students who took the test, OR b) 95 percent of students who were supposed to take the test. 2. When used on this page, the term “district” refers to both traditional public school districts and charters. Click Here to get back to our Overview of the Every Student Succeeds Act and view additional fact sheets.